From Beacon Hill to Southie, historic Boston is a town of vibrant neighborhoods knit into a seamless whole. But as Jim Banks and Trix Newcomb learn in a terrifying instant, it is also a city divided--split into three separate versions of itself by a mad magician once tasked with its protection. Jim is happily married to Jenny, with whom he has a young daughter, Holly. Trix is Jenny's best friend, practically a member of the family--although she has secretly been in love with Jenny for years. Then Jenny and Holly inexplicably disappear--and leave behind a Boston in which they never existed. Only Jim and Trix remember them. Only Jim and Trix can bring them back. With the help of Boston's Oracle, an elderly woman with magical powers, Jim and Trix travel between the fractured cities, for that is where Jenny and Holly have gone. But more is at stake than one family's happiness. If Jim and Trix should fail, the spell holding the separate Bostons apart will fail too, and the cities will reintegrate in a cataclysmic implosion. Someone, it seems, wants just that. 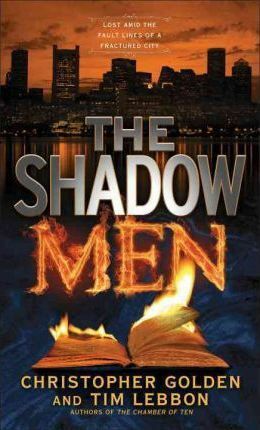 Someone with deadly shadow men at their disposal. Christopher Golden is the award-winning, Los Angeles Times bestselling author of such novels as The Myth Hunters and The Boys Are Back in Town. There are more than eight million copies of his books in print. Tim Lebbon is the critically acclaimed, bestselling author of more than twenty-five novels. He has won four British Fantasy Awards and a Bram Stoker Award, and several of his books and short stories are in development as movies.